I spotted the 10-point buck 150 yards above me on an open ridge, and with daylight fading fast, I decided I had better do something quick to get it down off the high ground. I made a loud series of “come hither” doe grunts by sucking on an A-Way Buck Grunter, and several does feeding in a cornfield just upwind of me started drifting over. I took my eyes off the ghostly buck to check on the does, and when I looked back, it had disappeared. The buck next appeared just 20 yards away, and within seconds, it was standing broadside on the other side of a single strand of fence wire, at maybe 5 yards. When a grunt call works, it really works. It was a perfectly symmetrical 10-point that probably would have scored close to 150 Boone & Crockett points, but also a young buck, maybe 2 or 3 years old. I remained immobile as the buck stared into the brush, trying to pinpoint the vocal doe. It was a good thing I was wearing my shaggy camo suit, because the buck was so close I could see snow flakes sticking to its eyelashes. I didn’t dare lift my muzzle-loader into shooting position, and I’d decided to let it pass, anyway. As an outfitter, I get paid to put clients on trophy-class Iowa bucks, and I utilize the most surefire methods possible. I’m a firm believer in elevated stands. When properly placed, they provide the most leeway for error. However, for my own hunts, I’ve rediscovered the challenge of getting down on the ground and taking on wily whitetails eyeball to eyeball. In addition to the adrenaline rush, I believe the ground approach provides a number of tactical advantages, too. One of the big disadvantages of hunting from a stationary stand is that a wary whitetail may be quick to pattern the position of that stand. 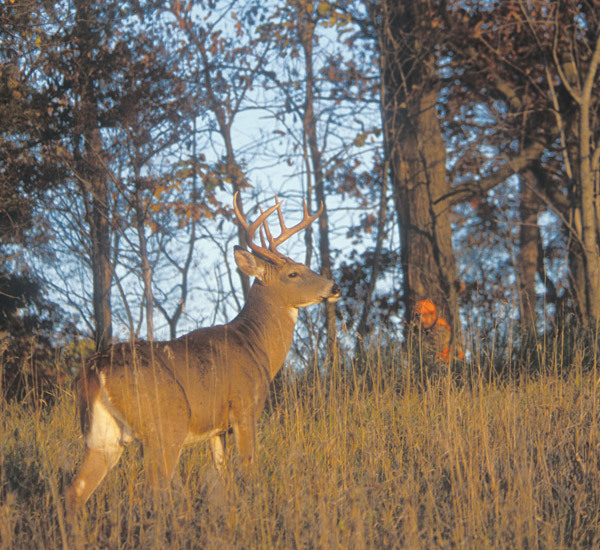 When is the last time you suckered a mature buck more than one time, hunting from the same tree stand or ground blind? But creeping along on the ground lets me change location and diversify tactics on the fly, virtually eliminating any risk of a deer patterning me. Late in the season, I may put a client on the ground, but in a location that hasn’t been hunted before. This little trick has produced several trophy bucks over the past couple of seasons. In the opening scenario, I was hunting a food plot with a tripod at the other end, a stand that had been hunted several times. But I sneaked in from a different direction and set up back in the timber at the opposite end, where there had never been a hunter. I’m sure this helped me bring that buck within spitting distance. Of course, having the breeze blowing in my face and looking like a pile of brush didn’t hurt, either. As more hunters take to the trees, bucks grow more leery of danger from above. I’ve also found that deer seem to be more attuned to the danger of a human shape, even if it is up off the ground. A few years back, I acquired a Shaggy Suit from Jerry Gentalalli, the owner of Rancho Safari company, and I’ve enjoyed more close encounters wearing this outfit than I previously thought possible. Turkeys step on my extended legs; coyotes stop within a few feet and then stare right at me. Deer have come close enough to touch with a gun barrel. My “wookie suit,” as I call it, has had a lot to do with me getting back into hunting whitetails on the ground. The very first time I wore it, I set up to try to rattle up a buck in a dense thicket along the Missouri River. Before settling in at the base of a box elder, I rolled around on the ground and got the burlap strips of the shaggy suit covered with leaves and debris. It was hard to tell where my outstretched legs stopped and the leaf-littered ground began. Because of the dense cover and an ultra-quiet approach to the stand, I decided to just tinkle the antlers and grunt a couple of soft doe calls. I still had the rattling antlers in hand when an eight-point came quick-stepping toward me. I gave another soft grunt, and the buck tromped to within a few yards without a downward glance. I rattled two more young bucks into point-blank range without either one of them giving me a second glance. At that point, I knew the wookie suit was going to get a lot of use. I quickly learned that rattling and grunting can be more effective on the ground than from an elevated stand, or even from a ground blind. Sounds may emanate a bit farther from an elevated stand, but sounds produced at ground level are more natural and less intimidating to approaching deer. The ground hunter also may be more creative with his techniques. Last fall, while bow hunting in Nebraska, I was hunkered down at the base of a huge cottonwood overlooking several well-used deer trails that ran alongside a deep creek. Again, I was wearing my wookie suit with head cover and leggings. My second series of rattling and grunts brought an eight-point tiptoeing along the trail below. When he was 40 yards out, I started scratching an antler in the leaves alongside my leg. This subtle sound piqued the deer’s curiosity to the point of bringing it within a few yards. When it caught a whiff of something it didn’t like, it started edging away. I gave a soft grunt accompanied by a bit more leaf rustling, and that brought the now-wary deer back to within 15 yards. By that time, a couple does had joined the buck, and I could hear more leaves rustling behind me. Within minutes, I was surrounded by turkeys, too, with several longbeards within 10 yards. I had a fall turkey license along with the deer tag, but no way could I raise my bow without spooking the deer or the turkeys. I ended up with nearly 100 turkeys on the hillside above me, scratching through the leaves and duff. I didn’t dare rattle or even grunt again. But talk about an adrenaline rush—and a great way to spend a beautiful fall evening. I like to set up with a log or large limb close at hand, and have brought several “hung up” bucks into range by rasping and scraping an antler over bark-covered wood. I’ve done this when bucks were less than 30 yards out without spooking them in the slightest, and teased some to within a few steps. I often thump the ground with antlers, rattle and scrape the leaves and duff, thrash the bushes. Another day last fall, I dropped off a friend to bowhunt a tree stand while I drove down the road another half-mile and then started ground hunting my way back toward him, along a river bottom. At my first stop, almost within sight of the parked truck, I rattled and grunted a small and a medium buck to within 20 yards. At three more stops, all within that half-mile, I rattled in four more bucks and a half-dozen does. Late in the afternoon, I rattled up a 125-class buck, and a few minutes after that one wandered off, I rattled and grunted in a 150-class buck. I missed that one at 15 yards when I tried to thread an arrow around a stump. The stump must have moved, ’cause I know I was steady as a rock. Fifteen minutes later, I called two does back within a few yards and then saw a monster buck running a doe off a ridge 100 yards in front of me. Even with live deer wandering around upwind of me, I couldn’t pull that buck away from his “hot” doe. But I enjoyed the show until dark, and yet another smaller buck passed at less than 10 yards, completely unconcerned about the clump of debris (me) piled up at the base of a tree. When ground hunting, I move slowly through the chosen area, letting deer sign, wind direction and terrain dictate where I set up. I always get situated in front of heavy cover or a large tree with lots of open ground in front, and then I let my camo do it’s job. I’ve learned that a small collapsible stool provides just enough elevation to improve visibility and also make it easier to shoot either bow or gun. When gun hunting, I never shoot without a rest, and I often have a bipod on the rifle. Most of the deer missed by my gun-hunting clients are missed because they try an offhand shot rather than taking the time to get a solid rest, first. I especially love ground hunting with a muzzle-loader during the late season, when most other hunters are situated in easy chairs at home, watching football on the tube. The antlered beasts are still out there, and the more miserable the weather, the more likely they are to be out scrounging up enough calories to keep themselves warm and comfortable. It’s important to hunt all day during the late season, same as it is during the peak of the rut. During severe cold or stormy weather, deer are apt to be up and feeding any time of day. I’ve watched lone bucks sneak into a food plot at midday, spend 15 minutes gorging on corn, beans, or turnips, and then disappear just as quickly as they arrived. Bucks may be harder to pattern during winter, but one sure thing is you aren’t going to tag one sitting around the coffee shop talking about deer hunting. And contrary to what some may say, bucks do respond to rattling and grunt calling during the late season. Anytime I hunt, from a stand or on the ground, I plan on rattling and grunt calling. Ground hunting is a lot more comfortable than hunting from an elevated stand, especially late in the season when the wind whistles around your ears. If I am planning to stay put for a while, I may bring a Heater Body suit, which basically is a heavily insulated but lightweight sleeping bag with legs. The outer shell is water-resistant camouflage. Make sure to get as comfortable as possible and in a good shooting position before you make that first calling sound. You must not move when the deer are responding, especially when hunting from the ground. Otherwise, you spook them away. And don’t be surprised should a critter appear within seconds of the first soft sounds. It’s truly amazing how close a careful approach can get you without spooking the nearby critters. This is why I start each and every calling session with soft, subtle grunts and rattling. Many states require a hunter to wear blaze orange during firearms season, and it’s a simple matter to don a legal vest over a camo suit. As long as you have good background cover and remain motionless at the key moments, blaze orange alone won’t spook a deer. I’ve got several places scouted for hunting deer on the ground this fall, and some new tricks to throw at ’em, too.